Direct Lease Driver of the Month, Clifford Bowe, Laurelville, Ohio, has more than 25 years of experience as a professional household goods mover. Cliff has a great driver rating and this is his second Driver of the Month award with the van line. He was also selected as Driver of the Year for 2014. Richard Brooks, Rainbow Moving & Storage, Waldorf, Md., earned Wheaton’s Permanent Fleet Driver of the Month award. 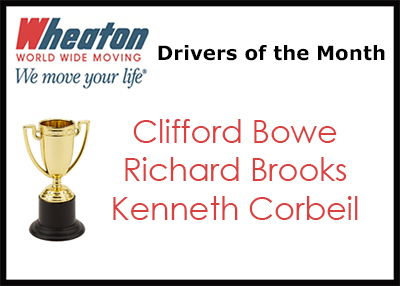 Richard has more than 25 years of experience as a professional mover and this is his fifth Driver of the Month award. Richard was also chosen as Driver of the Year for 2011. Kenneth Corbeil, Moving Relocation Specialists, Las Vegas, Nev., earned Wheaton’s Intermittent Fleet Driver of the Month award. Ken maintains a good performance rating and has three years of experience as a professional mover. This is his first Driver of the Month award with our company.